Debossed wristbands are produced with of a mold made from the artist proof that we created for you, based on your design request. 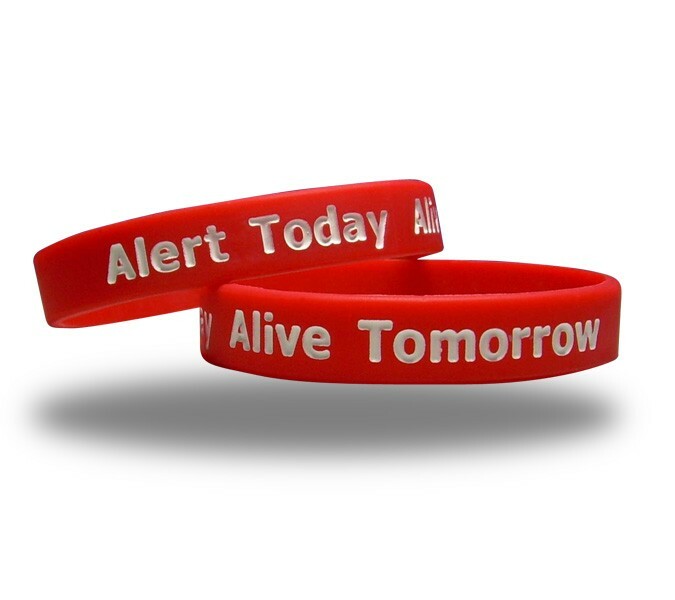 The mold has inclusions ( "recessed", similar in style to engraved) in it that represent the text, images, or any other type of imprint that will be recessed into the wristband surface. All designs are generated by our staff, based on your ideas and request. The artwork that you approve will be used to create YOUR mold. Once the mold is created by our factory staff, molten silicone (100%!) in the color of your choice, whether a single color, segmented colors, swirled color combination, custom PMS colors, or “glow in the dark” color is poured into the mold and allowed to cure. Once cured, the wristband is removed from the mold and the recessed text, logos and images are filled with environmentally safe, LEAD FREE paint that is guaranteed last. Once the Painting process is complete your custom Debossed Painted wristbands are packaged for delivery.